If you didn't win don't be sad! Another day means another print that Art by Ken is giving away. That is if you dare to answer another Hipster Super Mario's riddle.... and don't forget to use the map of Super Bushwick World! The winners will be able to pick up their prints on Friday, August 2, 2013 from 8 to 10PM at Mama Joy’s. Art by Ken himself will be chilling under the original painting of Super Bushwick World at the bar giving out high fives and prints to the lucky winners. 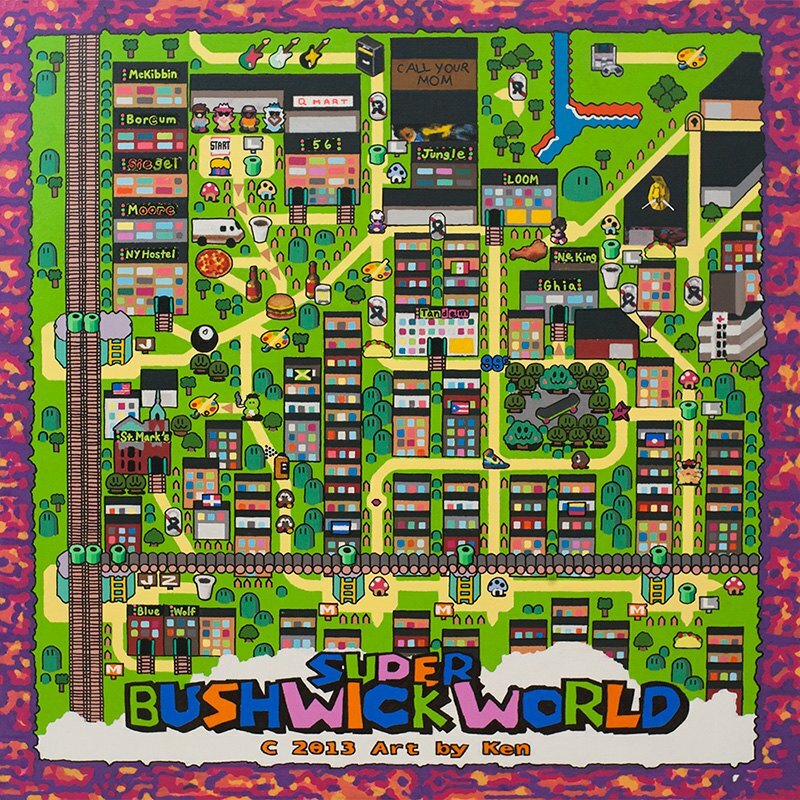 'Super Bushwick World' is a 36' x 36' large acrylic painting; a map of Bushwick as a video game world enticing thanks to its precise and hilarious details – from pixilated pizza for Roberta’s; Bushwick’s famous graffiti “Call Your Mom” to green pipes for the subway stops of the L and M trains. “The toads’ houses are for bodegas,” laughs Art by Ken. Art by Ken made also a bunch of prints for the fraction price of the original, so that every Bushwick apartment can have one to worship. You can try your luck and win a print here at Bushwick Daily, or you can simply get a print, which is available in two sizes through his website. A 12” x 12” print is only $30, and an 18” x 18” print costs $60, also a spanking good deal. For those who prefer to bring “Super Bushwick World” with them wherever they go (yes, even to Manhattan), they can pre-order one of the 25 LIMITED EDITION iPhone cases! The cases can be ordered for all recent model of the iPhone, and will ship on September 1, 2013. Oh, and if you’d prefer to drape your body in the awesomeness of “Super Bushwick World”, a vintage style baseball tee is now also available for pre-order! Shirts are available in unisex styles and feature an all over print design with colorblock sleeves and the Super Bushwick World logo on the chest.